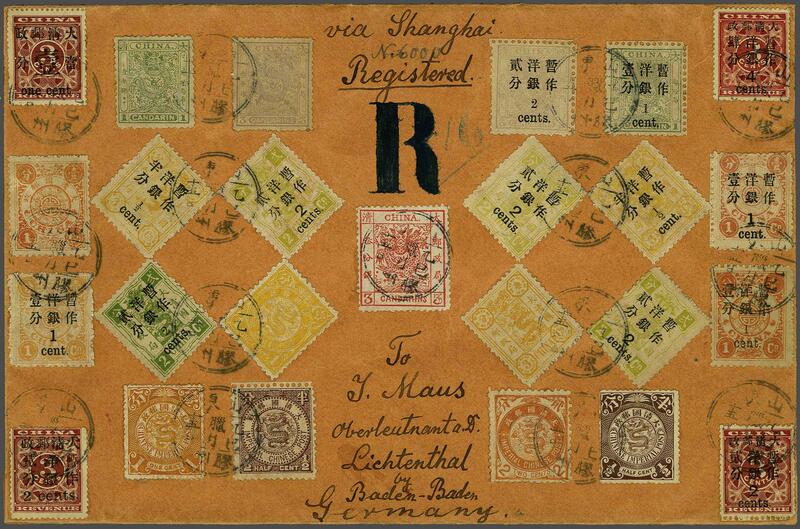 1878/98: 'Maus' registered cover franked by 25 different adhesives totalling 40 c.: 1883 Large Dragon 3 ca. vermilion; Small Dragon 1 ca. green, 3 ca. mauve; Dowager 1 ca. reddish orange, 3 ca. yellow; 1897 surcharged Small Dragon 1 c. on 1 ca. and 2 c. on 3 ca. ; surcharged Dowagers ½ c. on 3 ca. (large and small surcharge), 1 c. on 1 ca. (three different), 2 c. on 2 ca. green / pale green (four different); January 1897 Red Revenue 1 c. on 3 c. red, 2 c. on 3 c. (large and small), 4 c. on 3 c. red; Aug 1897 Imperial ½ c. purple, 1 c. orange-yellow, 2 c. orange and 1898 Coiling Dragon ½ c. brown and 1 c. orange all tied by Chinese lunar dated 'Kiaochow' datestamps in black with manuscript 'R' and registration number at top. Reverse with Lichtenthal cds of receipt (Feb 22, 1906). A dramatic franking with rare adhesives: this cover could perhaps be regarded as the 'ultimate' Maus cover with an extraordinary and colourful franking of great rarity and appeal.rnrnNote: Whilst philatelic, we believe this is the sole recorded cover with four different (Gibbons 88, 89, 90, 93) Red Revenue adhesives.